Welcome to another anything but new book review. These are reviews of books that are typically past their best-seller days, some of which may be languishing forgotten but are still worthy of a good read. Today's anything but new book is If Chins Could Kill: Confessions of a B Movie Actor. Hail to the Chin, baby. I have always been at least a minor fan of Bruce Campbell, though as of late my interest in his movies has grown, so as soon as I found out he wrote an autobiography back in 2001 (with a reissue/update in 2002) I tracked it down. The book flows fairly well, beginning with his early childhood as well as what motivated him to become an actor before moving quickly through high school and off to his first feature film The Evil Dead. 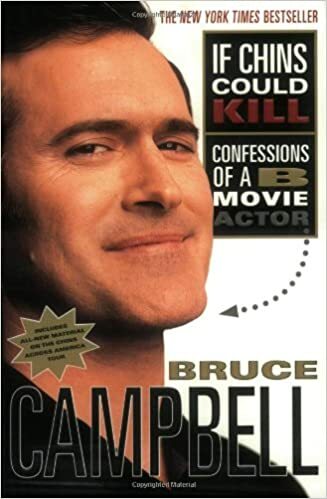 Whereas it easy for an autobiography to come off as dry or disingenuous If Chins Could Kill gives us a peak behind the scenes of Bruce Campbell’s career while entertaining us as the reader. “Waiting for that big call is where you second-guess yourself to death and play all of the ‘would have/should have/could have’ games over and over. I had two choices: wait be the phone and be tormented by every ring, or get as far away from it as I could. I chose the latter, and wandered the hills behind my house in southern California until the big verdict came down about thirty-0six hours later. Paramount had found their man and it was . . . Billy Zane. Do not pass Go. Do not collect $100. Bruce Campbell is entertaining while being informative. My only real complaint is that after reading the book I may know about his career but I don’t really feel like I know the man. After watching hours of YouTube videos featuring Bruce Campbell I find that talking to us about himself without ever really telling us much is something he excels at. We only ever really get a hint at his politics and never really know much about his personal life. Perhaps that is for the best. By staying focused on his career Campbell has provided an invaluable tool for anyone who wants to get into the arts. I try and avoid a straight up ratings system because they are so unreliable and open to interpretation. What you consider a 2/10 I might consider a 9/10. Instead I try and focus on who would enjoy this book, or at last benefit from it. If Chins Could Kill: Confessions of a B Movie Actor is great for those who want some insight in what it takes to become a working actor as well as what is involved if you want to try and reach a level of celebrity that Bruce Campbell tried to achieve briefly but quickly eschewed it when he realized he would rather be a working actor than go through the toil of attempts at celebrity. This book is great for ANYONE who wants to work in the arts. It shows the tenacity needed to push forward, and though his path to become a working actor can’t be replicated the lessons he learned and shared can be applied to any field and by anyone.